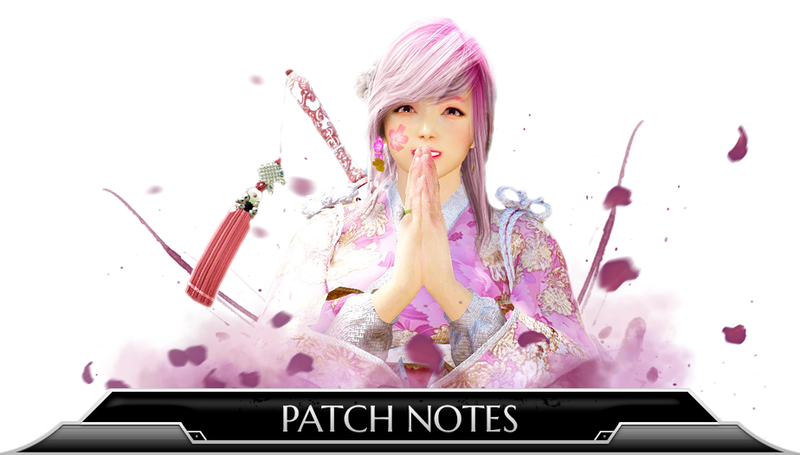 Found below are the patch notes for this week. We are excited to see the return of the Cherry Blossoms throughout the world! Join us in celebration and participate in the various events which can be found >Here<. This week’s patch is ~320MB. [Challenge] Cherry Blossom Decoration Box Event. Log in and receive [Event] Cherry Blossoms, and exchange them for a variety of rewards. For more information please check >here<. This resolves issues arising from before where players who logged in on the day of the maintenance (BEFORE the maintenance) could not get the event item for Day 1. Please log in after Mar. 23rd 0:00 UTC in order to claim your seal of Day 1. [Loyalty] Cherry Blossom Seed Event. Bring life to your house with a spring season theme by growing Cherry Blossom Seeds into Cherry Blossom Pots to decorate your interior! For more information please check >here<. The roadside along the path from Velia to Heidel. The roadside path from Kamasylve Temple to the Capital of Calpheon. Make your mark on Black Desert Online by participating in the Cherry Blossom Screenshot Event where players will get a shot at having their screenshot put on display in game, check >Here< for more information. For certain customization options, equipping the Kibelius Outfit and Sileshi Underwear simultaneously would cause some parts of the underwear to display on the outside of the outfit. This has been resolved. When equipping Venecil Shoes, some textures were not displaying correctly and were fixed. Limited Time Seasonal Items have arrived! These items will be available only until Apr. 12th (before maintenance). Equipment Tailoring Coupon can now be listed on the Marketplace. By using this coupon, You can transform certain crafted outfits into a costume. You can wear the exchanged costume in the Pearl Costume slots. * These items will be available only until Apr. 12th (before maintenance). Auto-align feature has been added for individual quick slot setting. When moving individual quick slots through the edit UI function will now automatically stick together when placed near each other. An option has been added to turn on or off the individual quick slots utilizing the ‘Auto-aligning’ function in the edit UI screen. When moving an item or skill from an individual quick slot to an empty quick slot will now result in the item or skill being removed from the previous slot. Wild horses in the mount area of Balenos’s territory and the Treant Forest in Calpheon’s territory, will no longer get stuck in the terrain. The marketplace has been adjusted so that items, even those in the bidding phase, will be checked with the lowest priced item of the same type. If an item of the same type with the lowest price (or within lower price range) is in the bidding phase, you will only be able to purchase/bid that lowest-priced version of the item. If an item of the same type is available for a lower price and is not in the bidding phase, you will only be able to purchase that lowest-priced version of the item. Fixed the issue where sometimes when the maximum durability is restored, the same item is continuously restored. It has been 2 months since we got our last message. Give us some info for once. Also the 3/15 KR changes to Ninja. Thanks. GG. Can Re if you want. NERF WIZARD AND WITCHES, THANKS. They could last week as well, the pearl to silver ratio is going to ensure it never happens though so it more or less remains entirely a p2w item that is a spitting insult to anyone who crafted a costume ever though. They're both 1500 pearls, tell us why anyone ever in the entire world would put up tailoring coupons. Yay! Can get the outfit for my tamer now. No Yukata for DK... Sad day. But it's a new class, so it's understandable that they won't have all the costumes (especially promotional ones) for the DK yet. All game settings were reset. Any particular reason? Or just a bug? Can u just remove the pop-in for the attendance rewards? Please spend more time balancing your classes and less time on milking the community with costumes. Thanks. Oh thank god my OCD can take a break now! Are you kidding me with this patch? All it looks like is a please give us your money for old re-hashed stuff. Not even outfit for DK to go with event is how little work they put into this. I say stop buying Pearl Shop items till they actually start looking to what the player base is saying. A company that made $100 million profit and can't even put money into fixing server issues doesn't deserve your money.Classes are broke, gave us lack luster Magoria, servers are laggy and dumping people all the time, events lately have shown the same "we'll just throw something out their to distract them from the issues." mentality, and really this game is starting to feel like any other where give us your money cause we just don't feel like trying anymore. Fix the damn game and get it moving forward again. Fix the damn server and make them playable again. Till then I think my wallet has become overcrowded, overheated, desynced, and BDO is disconnected from it.